How do modern women usually put a quick meal on the table? They buy meat, or pasta and put it together in no time, that’s how. What if you are a modern Celiac? Simple. Replacements, replacements, replacements. One of the things hard to find around here are gluten free breadcrumbs, it’s like they don’t even exist. After my husband started getting better, and before I was diagnosed myself, he started missing comfort foods – you know – breads and pastas. One night I was sitting in my kitchen putting a meat loaf together and I got an idea! Now, this might sound a little odd, but trust me, you won’t know the difference: substitute breadcrumbs for crunched up Lay’s potato chips! The taste is awesome and as long as you make sure your sausage is gluten free, you’ve got the makings for one heck of a meatloaf. Recently, I found some gluten free corn pasta by Ronzoni at Kroger, and although the reviews of corn pasta were mixed, I honestly cannot tell a huge difference – go figure. Gluten free doesn’t have to mean time intensive – let’s just make a few adjustments, shall we? Please remember to comment on this recipe if you try it. Everyone here just loves my food, but I’m convinced they are slightly biased…it could be worse over here, that’s for sure. This is quick, easy and gets my kids fed until they about burst – really. They don’t stop until it’s gone! This recipe makes 3 lbs – I have a lot of mouths to feed – but as long as you stick to a 2-1 ratio for your beef and pork, you can adjust it pretty easily. This recipe is also my very first share for Gluten Free Wednesdays over at The Gluten Free Homemaker! Go check it out! 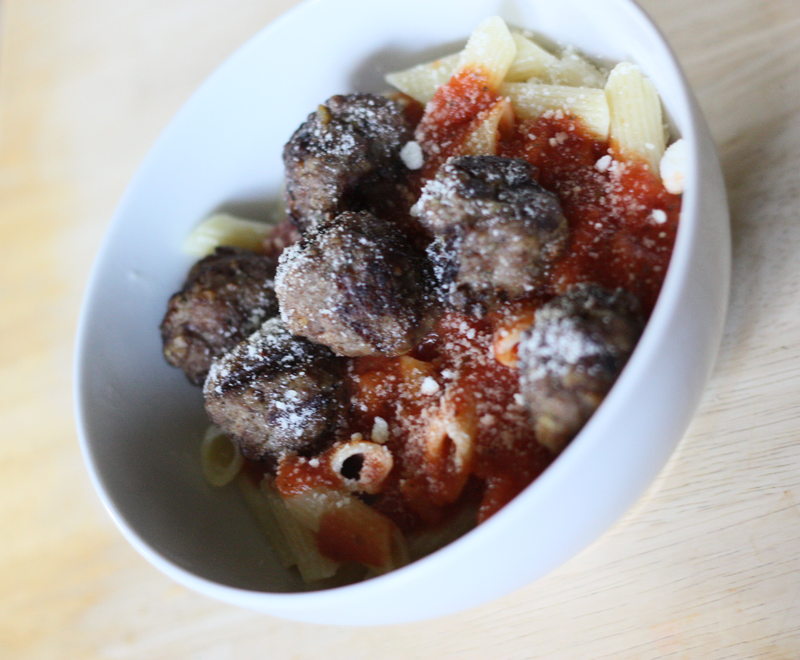 Combine all ingredients for the meatballs in a bowl. Throw the sauce into a saucepan and heat. I like to butter my pasta and sprinkle some Parmesan cheese over it, then add sauce or a warmed can of fire roasted tomatoes, and throw on the balls and sprinkle some more cheese, but you could cut out the dairy if you need to. There are some wonderful ways to make this dish your own, as in: endless possibilities here, the quick and easy way. Photo by my 11 year old daughter.